Alldata 2011 domestic has been uploaded by us, there was a lot of people putting AllData up on this site and now they have seem to deleted them, if you want European and Asian we will provided them if there is enough demand. 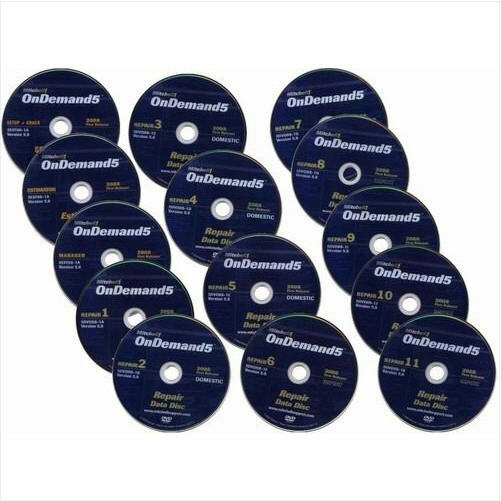 Overall, OnDemand5 Version 5.8 Repair and Estimator offer the industry's most comprehensive repair coverage and parts and labor database. OnDemand5 Version 5.8 Repair includes repair information for 1983 to current year domestic and import cars, light trucks and vans. OnDemand5 Version 5.8 Estimator gives accurate labor times for 1974 to current year domestic and import vehicle models. Powerful yet simple to navigate, the OnDemand5 Version 5.8 products also deliver a sophisticated search capability with a simple and intuitive layout. TSBs/Recalls/Tech Tips. Helpful tools that allow users to find shortcuts and diagnostic aides for the most difficult problems. Repair Articles, Specifications, Illustrations. Clear repair procedures, including diagnostics, enhanced by useful graphics and specifications. Wiring Diagrams. System diagrams can be printed, usually on one page, and brought to the vehicle to speed diagnosis. A consistent format includes connector, ground and component locations. Electrical Component Locators. Locators help technicians find important electrical components. ScanLink Interface. A powerful diagnostic tool that helps interpret and display Snap-on scan tool data. Quick Access. Frequently used data, such as technical service bulletins and scheduled maintenance services, is readily available. Superior Content Support. Mitchell 1 technical representatives are available via toll-free phone or fax to help repair technicians find the information they need.